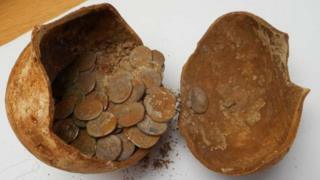 A museum has raised more than £40,000 towards buying a hoard of Roman coins found in Warwickshire that date back more than 1,900 years. The hoard of 440 silver denarii coins was uncovered during a 2015 dig at Edge Hill, with 78 coins dating to AD 68-69. They were found in a ceramic pot under the floor of a building. Warwickshire County Council Museum Service said a "big push" was now on to reach the target of £62,000, with £3,000 needing to be raised locally. The county council believes the 78 coins date from the start of the reign of Roman emperor Vespasian and feature the heads of his predecessor emperor "enemies" Galba, Otho and Vitellius. Councillor Dave Reilly, responsible for environment, heritage and culture, said: "This is an amazingly important find for Warwickshire and our Roman past. "I am delighted with the response so far from Warwickshire residents and businesses they have really got behind the campaign." A total of £44,000 has been raised so far, with £30,000 from the V&A Purchase Grant Fund and £14,000 from the Art Fund, the council said. A fundraising evening is now planned on 5 April at Market Hall Museum in Warwick. The event will be hosted by Dr Stanley Ireland of Warwick University, who catalogued the first South Warwickshire Hoard, with items on display from the the Edge Hill discovery.